Convert Text To RTF easily with Softinterface tools. Need to convert Text To RTF files? If so look no further, we've got the tool you need. 'Convert Doc' is a simple, yet sophisticated document conversion tool. 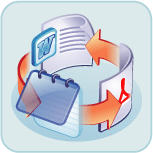 Convert to and from Text, RTF, HTML, PDF, DOC etc. NOTE: This program does not require any other software to be installed for it to work and it is exceptionally fast. Below we discuss how to use the programs user interface and command line interface to convert TXT To RTF files. Both methods allow you to automate your conversion needs easily. The user interface has a built in scheduler, and 'Convert Doc's command line (or COM/ActiveX interface) can be used with batch files or your programming language. NOTE: Text and RTF conversion is only one of several things this tool can do. To learn more about 'Convert Doc's complete functionality visit the 'Convert Doc' home page. This product supports both ASCII/ANSI and UNICODE text files. To convert Text To RTF using the programs user interface you can follow the directions below. 2. Select the 'Convert Doc' conversion method (the 'MS Word' method will also work) and select your input file. If you are converting a whole folder of TXT files, select the folder and specify all the files within it. For example to convert all the files in the folder "c:\My Files\" set the input file to "c:\My Files\*.TXT". Note the use of the asterisk "*" character which is required when specifying a whole folder. Next select the Input File Format (e.g. DOC, TXT, RTF, HTML etc) which in this case is Text (ASCII or UNICODE). 3. Specify the output file path and name. If you are doing a whole folder of Text To RTF specify the output file with the asterisk "*" in the name. For example "c:\My Output Files\*.RTF" is properly specified. Specify the file type to convert to by choosing the "Convert To File Format" which in this case is RTF (can also be DOC, HTM, TXT, RTF, PDF). 2. Select the 'Convert Doc' conversion method (Or the 'MS Word' conversion method) and select your input file. If you are converting a whole folder of RTF files, select the folder and specify all the RTF files within it. For example to convert all the files in the folder "c:\My Files\" set the input file to "c:\My Files\*.RTF". Note the use of the asterisk "*" character which is required when specify a whole folder. Next select the Input File Format (e.g. DOC, TXT, RTF, HTML etc) which in this case is RTF. 3. Specify the output file path and name. If you are doing a whole folder specify the output file with the asterisk "*" in the name. For example "c:\My Output Files\*.TXT" is properly specified. Specify the file type to convert to by choosing the "Convert To File Format" which in this case is TXT (can also be DOC, HTM, TXT, RTF, PDF). Click here for full documentation, keep reading for how to use the command line to do what we just described in the user interface. NOTE: 'Convert Doc' can be used simply with the graphical user interface (GUI). If you've never heard of 'Command Line' before, we would recommend not reading this section and instead download and try the software instead. The /M2 switch tells 'Convert Doc' to use the 'Convert Doc' method (it is one of 3 different possible conversion methods). /F1 is the input file type, which in this case is a text file. Looking up the file types within the File Type Constants Specification for the 'Convert Doc' method will show that the numeric value of 1 corresponds to a Text file. /C5 is the output file type, which in this case is a RTF file. Looking up the file types within the File Type Constants Specification for the 'Convert Doc' method will show that the numeric value of 5 corresponds to a RTF file. To convert all the TXT files in the D:\ToDo\ folder to RTF files in the same directory, the following syntax would be used.